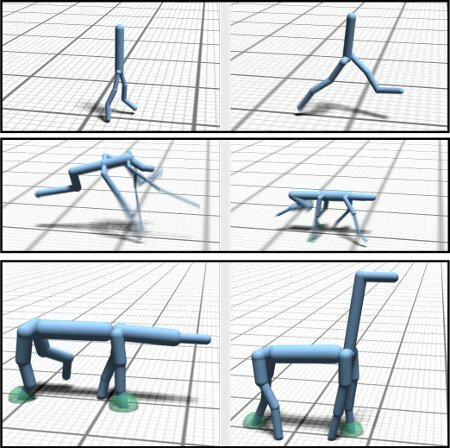 We present a fully automatic method for generating gaits and morphologies for legged animal locomotion. Given a specific animal's shape we can determine an efficient gait with which it can move. Similarly, we can also adapt the animal's morphology to be optimal for a specific locomotion task. We show that determining such gaits is possible without the need to specify a good initial motion, and without manually restricting the allowed gaits of each animal. Our approach is based on a hybrid optimization method which combines an efficient derivative-aware spacetime constraints optimization with a derivative-free approach able to find non-local solutions in high-dimensional discontinuous spaces. We demonstrate the effectiveness of this approach by synthesizing dynamic locomotions of bipeds, a quadruped, and an imaginary five-legged creature.